Christopher Hogwood is definitely a pig with personality He's bright, curious, and has just a slight infatuation with rich, inviting mud. 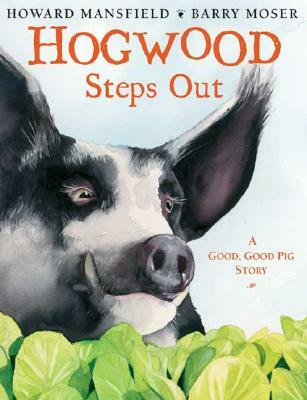 "Hogwood Steps Out" is Howard Mansfield's fictionalized account of his own pig's behavior on a fine spring day, a pig made famous in his wife Sy Montgomery's book, "The Good Good Pig." Barry Moser's luminescent paintings give Hogwood a personality that is all his own, allowing him to remind us to notice all the little wonderful things that surround us every day. "Hogwood Steps Out" is a 2009 Bank Street - Best Children's Book of the Year. Howard Mansfield is a New Hampshire journalist who has written several books relating to New England. "Hogwood Steps Out" is his first picture book.Barry Moser is a National Book Award-winning artist and the illustrator of more than 200 books for adults and children. His works have been on display in such auspicious places as the British Museum, the Metropolitan Museum of Art, and the National Gallery of Art. He lives in Massachusetts.